Married Richard Hardinge Stewart in St Pancras. 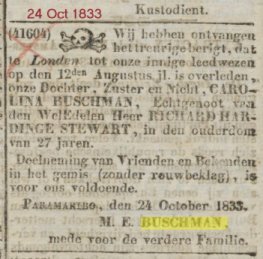 12 Jun, 1805, the illegitimate castice child Carolina Buschman, born 12 March. Mother Majorina Elizabeth Bijval, father not listed. 'Amelia' and 'Laurentia' are the names of two Buschman sisters, one of whom is married to Charles Stewart Drewry. Charles Stewart and Laurentia (nee Buschman), name their firstborn son William Tillotson after a beloved brother who died in 1835. The occurrence of the 'Tillotson' name in both families is curious and is a reference to Charles Stewart (senior)'s step father, Tillotson Laycock and/or his step-brother John Tillotson Laycock. The coincidence of the childrens' names with those of the Drewry-Buschman family, led us to assume that Caroline and Laurentia must be related and are sisters. We assumed, correctly, that Caroline is the elder since Laurentia starts her family ten years after Caroline starts hers. See also: The Stewart/Runciman Connection. Caroline's burial record at St Pancras, Camden, is amongst others who died in Grove Street that day followed by others in the Cholera Hospital (on the same day). Catherine Stewart (her mother-in-law, who also lived in Grove Street) was buried in January 1833. Thomas Allen Drewry's burial is also recorded in the St Pancras register, in August that year. He also lived in Grove Street. It is likely that Caroline, Catherine, and Thomas Allen died in the cholera epidemic that started in London in 1832. Catherine (Cathe Moody), widow of Cosmas would probably have been living with her son and daughter in law Caroline and Richard Hardinge Stewart. Thomas Allen Drewry may or may not have been living with them.